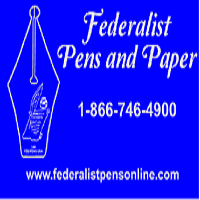 It's been two years already since we started Federalist Pens! It's hard to believe that it has been that long already! I have come a long way since the forum days (and eBay) of selling vintage items to fund the hobby that I love! The hobby that I still share with you, even as a retailer! To celebrate- the site is programmed to give you an additional 10% Off at Checkout! There is no coupon needed- just spend $20 or more, and Checkout will apply the discount! You will save over 20% on most items ALL MONTH LONG! It is my way of thanking you for the rapid success we are having! Shop Now! Many items will not be this low again! Some of the brands I represent do not even allow a discount- this will be waived during this period! Checkout does not discriminate (well, it could if I programmed it that way)! There is more! Most pen items will be shipped to US residents FREE this month! US Shipping is waived on pens $25 or more this month! Enjoy reduced shipping on ink, paper, and accessories! Thank You for your loyalty, and business! Here's to Year Three 2017-2018!